Highly processed carb-heavy foods are not good for us, but they taste good. Potato chips or french fries. How do you eat just one? There is a reason that happens. Our brains get tricked into craving MORE. A small study published this week shows that hours after we eat a highly processed meal with lots of carbohydrates – like white bread, or potato chips – we start to crave more of these junk foods. But as far as the young men who participated in the study knew – the shakes were the same. The two shakes were given to the young men in a lab environment on two different days, and researchers tracked their blood sugar and hunger levels periodically for four hours after the meal. At the four-hour mark, the men were given brain scans using functional magnetic resonance imaging, or fMRI – basically, a way of measuring brain activity. They found that the areas of the brain related to reward, craving, and addictive behavior lit up for the men in the high GI group as their brains reacted to the fast-acting carbs. That’s important, Ludwig explains, because four hours after a meal is the key time when decisions are made about how much to eat at the next meal. We’ve seen the connection between junk food and cravings before, as past studies have shown a link. But previous research used foods like cheesecake versus virtuous fare like boiled vegetables – in other words, foods you know and would have a strong psychological reaction to. This new research is an attempt to divide the biology from learned behavior, Ludwig explains. Madelyn Fernstrom, NBC News diet and health editor, advises that this study comes with a few limitations. For one, it’s a very small study, looking at the brain scans of just 12 obese men – plus, the fact that all the subjects were obese, something that Ludwig says was done because the overweight among us are, in general, the ones having the most trouble maintaining a healthy weight. Still, at this point, it’s too early to say that these cravings lead to obesity, says Fernstrom, who adds that an important follow-up study would be to do the same experiment using lean people. In real life, we don’t exactly have the option of choosing between a healthy and less healthy milkshake – unless you’re planning on switching to an all-Soylent diet. Elisa Zied, a registered dietitian in New York City, advises dieters to think about all the delicious and nutritious foods you can eat – rather than trying to immediately eliminate all processed foods at once. So if junk food lit up the areas of the brain involved with addiction – then is junk food addictive? It’s not that simple. The idea of a “food addict” is a bit ridiculous, in the first place, says Fernstrom, Ph. D., CNS. We have to eat to survive; we don’t have to consume alcohol or smoke cigarettes, for example, so these terms are not interchangeable. “The notion of food addiction is controversial, and the study doesn’t answer that question,” Ludwig says. “But it provides, I think, evidence for the possibility that highly processed food — apart from its calories, apart from its tastiness — could be tricking our brain into craving more food than we actually need. “So the bottom line is: Limiting these fast-acting carbs that have invaded our diet in the last 30 years may help overweight people avoid overeating,” Ludwig says. Something to keep in mind: These foods are NOT necessary for your diet, do nothing to help you nutritionally and only put on weight. 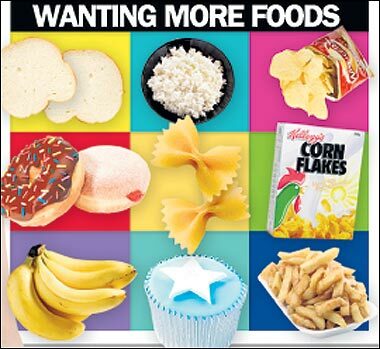 There is no nutritious reason to choose these items to go with your food. So, if you are ordering fries because it is a potato or a vegetable…you are wrong. They are a fried starchy vegetable. You are better off with real vegetables or if you must, half of a baked potato–or better than that starchy vegetable is a yam or sweet potato–not fried! Have you ever tried to grill asparagus or broccoli in tin foil with olive oil sprayed on it? DELISH! Try it instead of a starchy vegetable, something fried or processed food. Make new habits and get out of the addiction rut. Here is a list of the top 10 worst processed foods! Send me whatever you like, and thanks! I try!